Just like the height of the Lipstadt Trial. I have never been so rich in my life as during those four months.
. . . I SHALL have to smudge the outlines a bit. At mid-day at the hospital for pre-op briefing. Blood tests; blood pressure. Instruction in walking, sitting down, climbing stairs, and various other things I learned when I was one. I am very much regretting the decision to do this operation. I have been to the warehouse and we have the kind of problem that will remain a problem for a week or two. The wrong books in the wrong places. I will be in the hospital for the operation from January 12 to 17. I have expected, and Jae had half arranged, to be in England at this time for this purpose. 'Nuff said. I will have no visitors, as nobody else can drive. My Kiel Lawyer has had his front door vandalized: Who fingered him? I have not mentioned his name on my website. "Bleibt wohl nur der Angeklagte, bzw. einer von denen (auch bei SWR?). Ein Unfug." Presumably the culprit is a local in Kiel. Last year I read my first David Irving book, The War Path, followed by Hitler's War. I must say it was like a breath of fresh air. History was my Favourite subject at school. However now, I feel I was conned by my school's education as they only gave one side of the story of WW2. I am currently into the second volume of Churchill's War, having read the first Volume. I have started to look for Volume III The Sundered Dream on the internet to purchase but I can't find it anywhere. . . I cook an enormous haddock fillet for supper. Baked, with broccoli and carrots. The diet is working: it has knocked twenty-two pounds off me so far. Don't worry about the hospital visits. Jessica can't drive, and it is a remote country hospital. Jae was going to do it, but she has vanished. Besides, it turns out that two days after my release from the hospital Jessica flies to Berlin for a few days with a girlfriend on vacation. I'll be okay. Solitary confinement, like the Vienna prison all over again which caused the problem in the first place! John Jae sends another contribution. I thank him: "Very many thanks John, and for the corrections to Goebbels again. My mild depression is lifting and I think I shall resume work on Himmler today." Somebody sends me more of Hugo Jaeger's fine photos of military life in the Third Reich, 1938 to the end. It is a pity that the red dye has washed out of a lot of the colour transparencies, but Photoshop will automatically correct that. 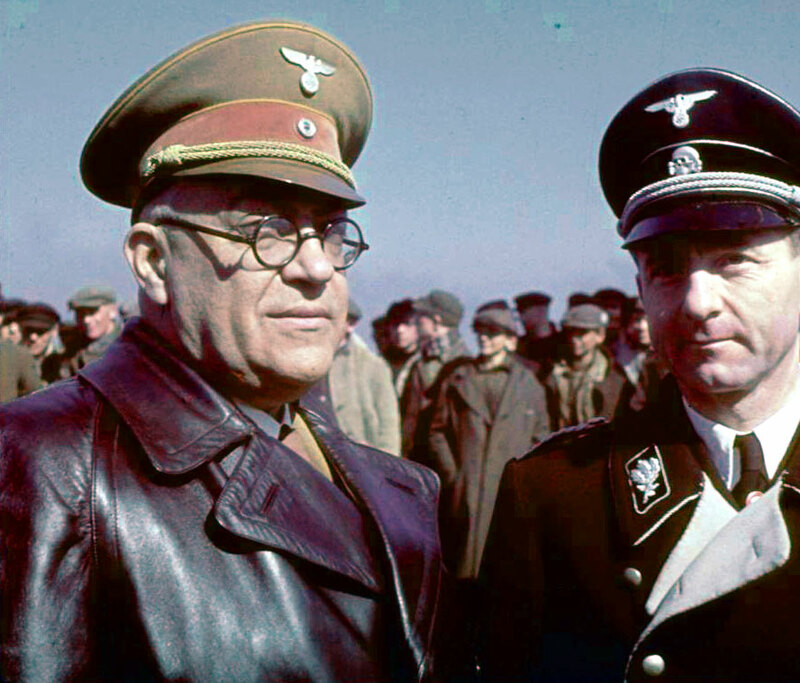 Left: Theo Morell, Hitler's physician, and Otto Dietrich, press chief. , whom I have never met. My ... friend just came through, a very mysterious Polish gentleman at your door, puzzled by the discrepancies in names between your bellpush and the name on the very thick packet which he handed over, once he was satisfied (by several questions) it was meant for me. I am seriously wishing I had not let myself in for this hoo-ha. Having a limp was not all that bad, except it did not look good when measured against the triathlon-training, weight-losing, champion-swimming, Einstein-thinking, wallet-wielding Australian. A FRIEND sends me this link: Kevin Myers: "Trinity College Dublin denies free speech to right-wing speakers". "Dear me," he writes. "2012 was only two days old when I rejected my first invitation of the year. It was to speak at the Hist, at Trinity College Dublin, on the subject of "freedom of speech". I am grateful to the nice people of the Hist for their kindness, but let me make it clear. Speaking about freedom of speech at a place like Trinity is like discussing virginity in a brothel. Yet far from being in the forefront of a campaign for free speech, TCD has been denying freedom of speech to 'right-wing' speakers for some considerable time: most notoriously, and most frequently, the historian David Irving. . ."
I add this link, and put it on my front page: Trinity College Dublin cancels planned talk by David Irving. If people search my website for TRINITY they will find many more examples. A POOR night; worried about Jessica who "borrowed" twenty pounds in the way teenagers do, and went out to Notting Hill late last night, and did not return until the early hours. She will earn a lecture for that. I just wanted to thank you for all your hard work and resolve through all that you've endured. I want you to know that I've shown your movie to several friends of mine and eagerly suggest your books as the authority on the subject of the Second European Civil War. I find your prose to be quite enjoyable and your research unsurpassed. I hope that someday I get to meet you and [you will] perhaps sign your books for me. Although you've endured theft, ridicule, and assorted threats, you've remained calm and dignified during your public appearances. This is how you win. The truth will prevail someday. At least, that is my hope. It's just a matter of the "noble lie" as Plato might have put it. The only difference is, the stakes for our people are beyond compare. The noble lie makes it difficult to pursue our destiny unfettered. You're one of my personal heroes. I send him a suitable reply. At midday at the hospital for a blood-group sample. Then on to Sainsbury's, where I buy two fillet steaks for our supper tonight, and a sack of Ibuprofen tablets for the coming week, and to Eton Wick to take the Pigmobile out of her storage garage and to the depot for her MoT certificate. First step toward making this elderly lady lawful again (she has been off the road for months). I MAKE a furious discovery at the garage: The owner has left the padlock unlocked, the garage door is tipped up wide open, and as I walk round the van I see the driver's window has been freshly smashed in and the expensive radio (it cost more than the van) is ripped out and gone. It takes me ten minutes to sweep the crystals off the driver's seat. At least the thief did not open the Pigmobile's rear and steal the contents. Bad start to a day. I have a cup of tea with our ex-housekeeper Dawn Sanderson afterwards, and a chat. She cannot fathom what has got into . . . Moi non plus. . . Dawn is shocked by the details . . . She draws instantly the appropriate conclusions. Somebody sends me a news item about hackers. "Yes it is an ugly story," I tell him. "The hackers have put personal details of members of the NPD on the Internet. Which invites them to be dismissed from their jobs, have their houses vandalized, etc., etc." -- Nice folks, our enemies. I finally resume work on Himmler during the evening. 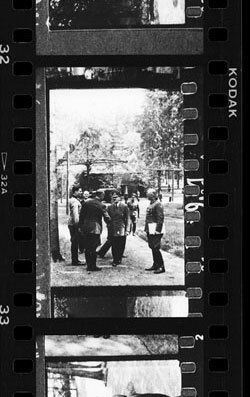 The photographic service in College Park, Maryland, has identified for me a strip of negatives which Professor Peter Hoffmann of Montreal first found, and sends me a scan so I can pick out the one I need. No prizes for guessing which. It is the traitor Stauffenberg, visiting the Wolf's Lair, standing (at left) at awed attention in front of the Führer whom he later decides to murder, and fails. I myself interviewed three of the others in the photo, and translated the memoirs of a fourth, Field-Marshal Keitel. Rather late in life - in 2011 and at the age of 56(!) - this technical writer discovered a writer of a somewhat different ilk: a certain David Irving. Although unsure as to what to make of this Irving, one thing soon became clear, namely, there were not one but two of him: there was the Irving reported by the media, and there was the Irving portrayed by his own web site, his You Tube talks, and his own writings. Of the two, the latter Irving seemed immensely preferable. While undeniably independent-minded, and arguably sheer bloody-minded, this latter Irving nevertheless seemed and seems to care very much about issues such as truth and the impartial evaluation of evidence. Therefore, by way of an interim comment as it were (since this technical writer is still not quite sure of what to make of the Irving) let me at the very least THANK YOU VERY MUCH for forcing a rethink of a number of things previously considered unassailable fact. The world, it seems, is a somewhat different place to that previously assumed. However, . . . I can for the moment merely wish you, David Irving. . . victory over the Black Dog (you are not the only one). [details]. Thank you very much however for that extremely thoughtful letter about my writing and other battles." I am baffled that so many people have suddenly started writing such letters. Is there a sign pinned to my back? "This geezer has not long to go, cheer him up while you can?" A quick check satisfies me on that score. We are dealing with a thick-headed lawyer in Indiana. His letters, originally cordial, have become increasingly belligerent, which does nothing to help his client (to whom I weeks ago sent two cheques in full settlement of the more than modest claims). I am puzzled about where those cheques have vanished to. . .
A HOOSIER friend has sent me a picture of Jae at her family Christmas party in Minnesota. She looks really happy. Her smile out-dazzles them all. I know that smile so well. It totally eclipses the rather blurred, sheepish-looking man at her side. My three years working with her have been the highlight so far of this century, and I am a better man because of them. We all wish her Godspeed as she sets out on her latest new adventure. I do hope she keeps up her singing lessons (she has a wonderful voice with perfect pitch). I half-heartedly press B. to get that piece of paper between us. Twenty years seems long enough for an engagement! 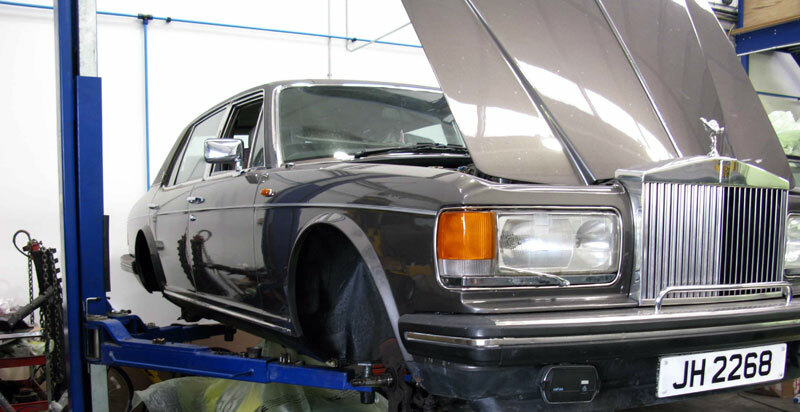 LINDA H. has written: "Is there any chance that whilst you are in England we can finalise the paperwork to sign the car over to you?" She is talking about the thirty-year old Rolls I acquired at bargain price three years ago from her late husband. It belonged before him to Lord Hanson. It has been in the workshop ever since, and I have yet to sit in it. I reply: "I go under the knife on Thursday and will be immobile for several weeks after that, I think, but as soon as I can get out I will come round. I understand I am not permitted legally to drive for six weeks," meaning after they stitch me together again. I leave Kew in my little one-liter Skoda at ten-thirty a.m. and drive down to Wiltshire. In bright West Country sunshine I rocket straight down the M4 to Chippenham, and then down the winding lanes to Dilton Marsh, beneath the famed White Horse, so thoughtfully carved into the hillside by Ancient Brits for modern tourists to look at. It is a reprise of my last visit to John's cottage: all the lights are on, two vehicles are parked outside, and the dogs inside are wildly barking, but the doors are locked, both there and at the Keratex factory. I hang around for fifteen minutes, but nobody is around. So back to Melksham. I load up with forty boxes of books, and then head off back to London. The warehouseman asks where the Pigmobile is, and I tell him the sad story. I feel slightly guilty about the old girl: I should have looked after her better. Never was much good with wimmin. Heavy-laden, the little Skoda is like a woman expecting quads, but waddles back eastwards at eighty or ninety miles an hour. I call in briefly at the Mobility Store at Taplow to get a long-reach picker-upper. Preparing for this new prison-like ordeal. The manager says: "You're the third customer I've had today whose duff hip is being replaced this Thursday." Well, as long as Dr Gian Singer doesn't give me somebody else's. I can't afford to have my right half mincing around like a tango-teacher or ballerina, while my left half hulks like a former steelworker. I park the pregnant Skoda outside the apartment at four p.m after the three-hundred-mile round trip. Now to get a pallet of books shipped over to Atlanta, where they are really needed. This is hands-on writing and publishing, with a vengeance. Not that there is an ounce of vengefulness in my miserable frame: I am a Christian, and we Brits know how to turn the other cheek. Even so: No more driving now for six weeks. Nobody now to work out my furies on. 1992 FLASHBACK: Trinity College Dublin cancels planned talk by David Irving.